The muskrat, is a medium-sized semi-aquatic rodent native to North America. The muskrat is found in wetlands over a wide range of climates and habitats. The muskrat is a stout, chunky animal with short legs. An adult ranges from 22 to 25 inches long. The 11-inch black tail is scaly, hairless and laterally flattened. The average weight of a mature muskrat is about 2.5 pounds. The large, broad hind feet are partially webbed and well-adapted for swimming. They have dense, silky, grayish under fur heavily overlaid on the back and sides with glossy, dark-brown guard hairs. Muskrats are found in just about every state of the union including small areas of Florida and California. Seldom found far from water, they prefer the still or slow-moving water of marshes, ponds and streams. Tularemia – A bacterial disease associated with various animal species especially beavers, rabbits, and other rodents. Tularemia occurs year-round throughout the United States and in Colorado, two seasonal peaks, the first in May and another in October. People can contract tularemia by handling infected animal carcasses, eating or drinking contaminated food or water, or breathing in F. tularensis. Symptoms could include sudden fever/chills, headaches, muscle aches, cough, progressive weakness, and pneumonia. If treated quickly with the appropriate antibiotics, this potentially fatal disease is curable. Rubber gloves should be worn when handling beavers or working where they live. Tyzzer’s Disease – A bacterial disease of wildlife caused by the organism Bacillus piliformis. Tyzzer’s Disease has been identified in muskrats and rabbits. Natural transmission likely occurs through the ingestion of these spores by susceptible individuals from contaminated housing, bedding or feed. The gregarious behavior of muskrats and rabbits increases the likelihood of infection by exposing these species to infected areas. An area which has infected animals present remains contaminated for a considerable length of time. Muskrats can cause damage to property when they burrow into ditch banks as they make their den and by eating vegetation such as lawn grass, or garden and ornamental plants. Hole digging activities undermine earthen dams and dikes. Damages also occur to irrigation canals and farm ponds. 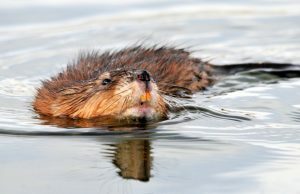 Muskrat feeding activities often destroy the roots of the vegetation, and it may take 15-20 years for the habitat to return to its original state. This industrious little rodent can cause a lot of damage in a little time. Although the feeding habits of muskrats may result in some damage to agricultural or ornamental crops growing near water, the principal cause for concern is the potential damage to earthen water- retaining structures, resulting from muskrat burrowing activities. Extensive tunneling into earthen dams may result in water leaks or even in the loss of stored water. When muskrat numbers get too high in late summer and fall, the population becomes stressed. (for example, when they burrow in a pond dam) and manage their numbers for ecological benefits. Muskrats may be trapped or shot when responsible for property damage. An ADC wildlife professional will come out to your location and discuss with you the options you have to rid yourself of these nuisance animals.